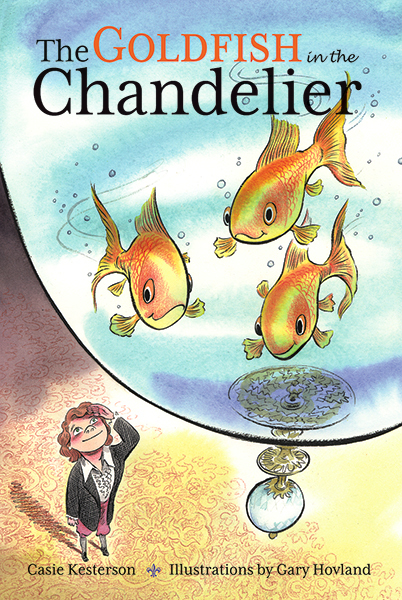 This is a charming tale about the creation of a very unusual chandelier...Here is a different kind of adventure story; "The Goldfish in the Chandelier" takes place just outside of Paris in the early 1800s. Uncle Henri is stuck. He has been commissioned to design a chandelier for a great house in Paris, but can't think what to do. To the rescue comes Louis Alexandre, his young nephew, with some dazzling ideas inspired by Alexander the Great and the first hot-air balloon flights over Paris. Together, they combine their imagination to create something that never existed before - something completely new and unexpected! Formerly on staff at the Getty Research Institute, Casie Kesterson currently is a consultant specializing in matters relating to the history of collecting. Gary Hovland's illustrations have appeared in such nationally and internationally known publications as the New Yorker, the Wall Street Journal, and the New York Times. His illustrations for If the Walls Could Talk: Family Life at the White House (Simon & Schuster, 2004) won a Toy Portfolio Platinum Book Award in 2005.